Nordics-based IT businesses looking to recruit are facing tough competition for the best talent. The most sustainable, long-term solution to the skills shortage is to train more talent and also to encourage more cross-border recruitments. However, businesses will be required to hone their brand to market themselves as a desirable employer, as the finest talent will always seek out the best employers. When there’s a shortage of anything on the market, there is a need for businesses to stand out from the competition. “Employer branding” may be the latest industry buzz word, but the strategic importance of your reputation as a place of work continues to grow. If you are looking for a reputational association with the most sought-after digital talent, the challenges should not be underestimated; cultivating the right sort of brand is no easy task, even if you are an established, high profile brand. Developers, for instance, are a relatively new target audience for many businesses and one they may well struggle to reach out to. It’s not easy for businesses to stand out from their competitors – after all, most will have been set up since the noughties, specialise in tech and are all after the same pool of talent. It goes without saying that it’s always a sensible idea to outsource part of your project and really invest in establishing a solid network of long-lasting partnerships, as you would struggle to run a competitive business in the long term without them. However, if the performance of a large chunk of your business is dependent on external providers, then you have a problem on your hands. The success of your strategy hinges on your ability to ensure that you retain and develop the expertise your business needs. The results of Universum’s latest employer branding student survey make for interesting reading. The number one business across Finland, Sweden and Denmark is Google, which is also the top-ranked company across the world. As with the rest of the globe, Microsoft comes in at number two both in Finland and in Denmark, while in Sweden it’s had to settle for third place, overtaken by Spotify. A closer look at the top ten in all three countries reveals that the top spots are taken by IT and/or technology businesses that benefit from a high profile either locally or globally. Gaming and entertainment sector businesses are also highly rated by students in all three countries. In that sense, Lego, ranked number three in Denmark, strikes me as a gaming and entertainment specialist rather than a manufacturer of actual Lego bricks. At the same time, Lego is an excellent example of a company that has consistently continued to develop its business over the years, making the most of the new opportunities coming its way. In Sweden, three strong performers from non-IT fields have made it into the top ten: Volvo Group, Ikea and SÄPO, the Swedish Security Service. In Denmark, there’s just one, Novo Nordisk and in Finland, none. There is a serious skills deficit across many well-known and highly traditional non-IT sector businesses and they also already employ a significant number of the specialist staff available – by themselves or through their partners. These companies tend to employ a large number of specialists through their partners. However, what they have failed to do so far is to establish a reputation as a desirable employer among IT students. It goes without saying that this matters hugely when it comes to attracting the right applicants. WHAT ARE THE KEY PULL FACTORS FOR IT SUPERTALENT? Commentators have tended to highlight the unusually low ranking the respondents have given in Scandinavia to pay as a factor. These two reports are by no means identical, with one focusing on the top Nordic employers as ranked by IT students while the other surveyed software developers already in employment. However, they do provide a useful insight to the topic. At Barona IT, we are privileged to be in daily contact with a wealth of businesses operating in Finland, Sweden and Denmark. Many businesses in traditional industry segments are already embracing the opportunities presented by the digital transformation, which makes them well placed to offer many of the pull factors listed in the top 5 above. The Universum top 10 results notwithstanding, these companies have already succeeded in demonstrably raising their profile among IT students. 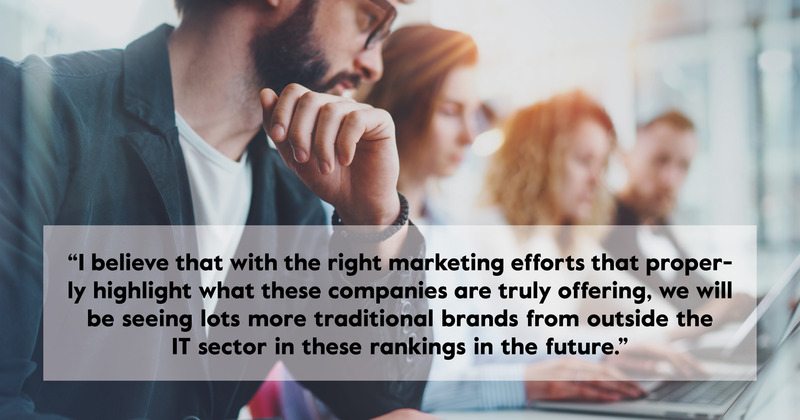 “I believe that with the right marketing efforts that properly highlight what these companies are truly offering, we will be seeing lots more traditional brands from outside the IT sector in these rankings in the future." The situation is also challenging for the jobseekers themselves, as it is virtually impossible for busy professionals to know what opportunities might be available to them at any one time. When it comes to choices, we all make them on the basis of our own personal perceptions and preferences, and these are based on our understanding of the world as we know it. At Barona IT, we see the Nordics as one single market. In global terms, the Nordic countries offer a truly unbeatable standard of living: people here live in societies that are both technologically and socially advanced and provide a stable and secure living environment, where people can focus on making their career and other dreams a reality. In terms of job prospects, many large global names are based in the region, but there’s also the benefit of a dynamic and prosperous SME sector. “What we need to do here in the Nordics to effectively compete in the global marketplace for the best talent is to join forces and work together to build our “employer brand” and highlight the unique opportunities we have to offer in this part of the world. To attract the right talent from abroad, we will also need to see the political will to speed up the immigration process." At Barona IT, we have developed the Northstar concept, which is designed to make it easier for digital pioneers, such as developers, architects and designers, to navigate their way towards their dream careers here in the Nordics. We want to use this concept to foster links between incoming talent who are focused on innovation and change, and companies they may not have picked up on based on their previous experience and any market research they may have carried out. There are plenty of opportunities out there and fascinating projects are underway across all sectors. The fact is that the digital world is evolving rapidly and people looking for new opportunities may not always have access to the most up-to-date information about what is available. Henrik Rantala is responsible for business operations at Barona IT. Barona IT employs over 1000 experts annually through various resourcing solutions in Finland, Sweden, Denmark and Poland. From Poland we provide a range of Service Desk services to the Nordic countries. The lack of IT professionals – how to ensure your company’s growth also in the future?